Background and Aims: Ultrasound imaging before neuraxial blocks was reported to improve the ease of insertion and minimize the traumatic trials. However, the data about the use of ultrasound in thoracic epidural block are scanty. In this study, pre-insertion ultrasound scanning was compared to traditional manual palpation technique for insertion of the thoracic epidural catheter in abdominal operations. Subjects and Methods: Forty-eight patients scheduled to midline laparotomy under combined general anesthesia with thoracic epidural analgesia were included in the study. Patients were divided into two groups with regard to technique of epidural catheter insertion; ultrasound group (done ultrasound screening to determine the needle insertion point, angle of insertion, and depth of epidural space) and manual palpation group (used the traditional manual palpation technique). Number of puncture attempts, number of puncture levels, and number of needle redirection attempts were reported. Time of catheter insertion and complications were also reported in both groups. Results: Ultrasound group showed lower number of puncture attempts (1 [1, 1.25] vs. 1.5 [1, 2.75], P = 0.008), puncture levels (1 (1, 1) vs. 1 [1, 2], P = 0.002), and needle redirection attempts (0 [0, 2.25] vs. 3.5 [2, 5], P = 0.00). Ultrasound-guided group showed shorter time for catheter insertion compared to manual palpation group (140 ± 24 s vs. 213 ± 71 s P = 0.00). Conclusion: Preprocedural ultrasound imaging increased the incidence of first pass success in thoracic epidural catheter insertion and reduced the catheter insertion time compared to manual palpation method. Ultrasound imaging has been reported with various techniques for neuraxial blocks., Preprocedural ultrasound scanning provided reliable and accurate information on several critical aspects needed for successful epidural placement, such as the interspace level, the midline of the spine, the optimal puncture point, and the optimal angle for needle insertion. Ultrasound was also helpful in determining the depth to the epidural space  and subarachnoid space. To the best of our knowledge, the value of using ultrasound in guiding neuraxial blocks was reported in subarachnoid and lumbar epidural but not thoracic epidural blocks. The aim of this work is to study the efficacy of pre-procedural ultrasound screening in improving the success of thoracic epidural catheter insertion in abdominal operations with midline incision. The study was approved by the ethics and research committee and by Cairo University Council. All the steps of the procedure were described to the patients and their written consent was obtained. A computer generated random list was generated; random numbers were concealed in opaque concealed envelopes. A randomized controlled study was carried out in Cairo university hospitals. Forty-eight patients scheduled for elective abdominal surgeries (e.g., open splenectomy, cholecystectomy, gastric operation and colorectal surgery), of the American Society of Anesthesiologists (ASA) Grade I and II, aged between 18 and 60 years, of both genders, with body mass index (BMI) <30. Exclusion criteria were pregnancy, neurological or neuromuscular disease, and the presence of contraindication to spinal or epidural technique (allergy to local anesthetic drugs, infection at the site of needle insertion, coagulopathy, or receiving oral anticoagulants). All patients were given midazolam (3 mg), Ranitidine (50 mg) and metoclopramide (10 mg) as premedication. On arrival to the operating room, routine monitors were applied (electrocardiogram, automatic blood pressure, and pulse oximeter) and an intravenous infusion of crystalloid (500 cc) was established. Then, combined thoracic epidural with general anesthesia technique was applied. Patients received epidural anesthesia either with the traditional manual palpation technique (manual palpation group, n = 24) or using preinsertion ultrasound examination (ultrasound group, n = 24) to determine the intervertebral space, angle of insertion, and depth of the dura. After epidural catheter insertion, balanced general anesthesia was performed using propofol (2 mg/Kg) and fentanyl (2 μg/Kg). Endotracheal intubation was facilitated by atracurium (0.5 mg/Kg). Maintenance of anesthesia was achieved using isoflurane to maintain stable arterial blood pressure in addition to atracurium increments. By the end of the operation, residual neuromuscular blockade was reversed by neostigmine (0.05 mg/Kg) and atropine (0.01 mg/Kg) followed by extubation. In the manual palpation group, the epidural catheter was placed with the patient sitting down, resting his legs on a chair and his arms by his sides. The tip of scapulae denoted the level of T7. The epidural catheter was inserted at level of the T9/T10 t interspace using 18 gauge Tuohy needle in the paramedian approach. The epidural space was identified using the “loss of resistance” to air technique. Test dose of 3 ml lidocaine (2%) containing epinephrine (1:200,000) was injected into the epidural catheter after aspiration. For ultrasound examination, high-frequency linear probe (8 MHz) of Mindray device was used. Ultrasound visualization was performed in two planes parasagital longitudinal and transverse planes. The transducer was initially placed in parasagittal articular process view at the level of the sacrum (presented on ultrasound as flat table-like hyperechoic area). Once sacrum was identified the probe was moved in a cephalad direction to identify the intervertebral spaces (acoustic windows) and spinous processes (acoustic shadows) of the lumbar and thoracic vertebrae (saw-like image) till reaching the desired level (T9/T10 interspace). The articulation of the 12th rib with the transverse process of T12 vertebrae was also used to confirm the intervertebral level. With transverse plane scanning, the most superficial reflective surface the probe scan was the spinous process of the vertebrae underlying the probe (a long dark area perpendicular to the surface of the U/S probe). When the probe was held in the transverse plane and moved up and down, the shadow of the spinous process appeared and disappeared as the probe moved over them. When there was no superficial reflecting bony surface, we were over an interspace. Ligamentum flavum (LF) usually appeared as a brighter band, small adjustment in angulation and position allowed us to see the dark gap of the thecal space and bright reflection of the dura. The intervertebral level was marked on the skin by marker pen with a transverse line passing through the midpoint of the transducer. After determining the point of needle insertion, ultrasound was used to determine the LF-dural complex and angle of insertion of the needle. The depth was measured in the paramedian sagittal plane; the probe was held parallel to the long axis to the vertebral columns lightly angled toward the midline to visualize the LF-dura mater complex. After aseptic preparation was performed, the thoracic puncture was carried out utilizing the labeled landmarks for needle introduction. The primary outcome measured is the rate of successful epidural catheter insertion at the first puncture site. Secondary outcome parameters include the number of puncture attempts (every separate insertion of the needle), number of attempts of needle redirection (a needle requiring withdrawal for redirection for the same intervertebral level), number of puncture levels (moving to a second interspace after three times insertion of needle), duration of the procedure (time from the handle of Touhy needle till successful insertion of the catheter and was measured by an observer with a stopwatch), and ultrasound depth of LF-dura mater complex was measured compared to that measured using needle depth. All patients were interviewed regarding neuroaxial anesthesia side effects such as paraesthesia and backache. Our primary outcome was the rate of the successful first pass. The rate of the successful first pass was reported by Arzola et al. with palpation method to be 50%. We calculated the sample size to detect an increase in the successful first pass to 90%. A minimum number of 24 patients per group were calculated after exclusion of drop-out to have a study power of 80% and alpha error 0.05. Data were analyzed using SPSS program. Data were checked for normality using Shapiro–Wilk test. Normally distributed variables were presented as mean (standard deviation) and analyzed using independent sample t-test. Abnormally distributed variables were presented as medians (quartiles) and analyzed using Mann–Whitney test. Categorical variables were presented as number (frequency) and analyzed using the Chi-square test. Pearson correlation analysis will be used to find the relationship between ultrasound depth and actual needle depth. The value of P ≤ 0.05 was considered statistically significant. Forty-eight patients were included in the study. Both groups were comparable with regard to demographic data (age, weight, BMI, and ASA status), as shown in [Table 1]. 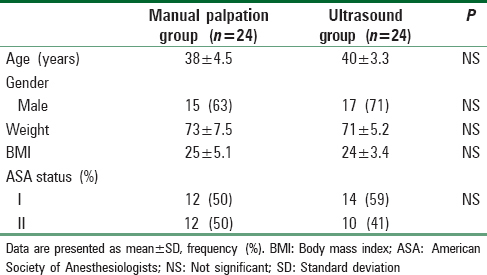 Compared to manual palpation group, ultrasound guided group of patients showed lower number of puncture attempts (traditional group: 1.5 [1, 2.75], ultrasound group: 1 [1, 1.25] P = 0.008), lower number of puncture levels [traditional group: 1 (1, 2), ultrasound group: 1 (1, 1), P = 0.002), and lower number of needle redirection (traditional group: 3.5 [2, 5], ultrasound group: 0 [0, 2.25], P = 0.00). Ultrasound-guided group of patients showed also less time to insert the epidural catheter (153 ± 38 vs. 216 ± 78, P = 0.00), as shown in [Table 2]. 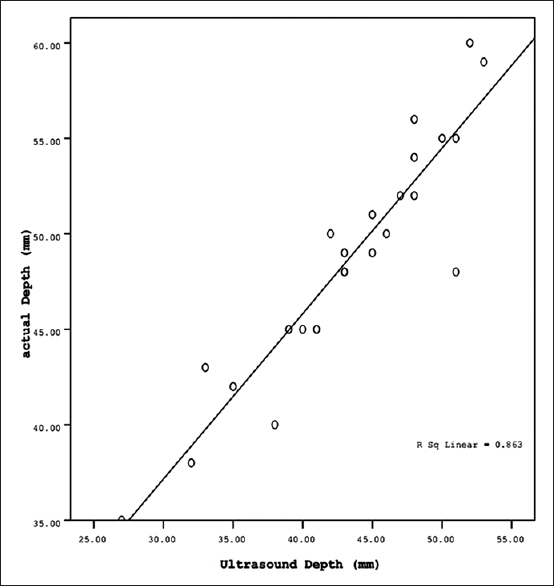 With regard to the use of ultrasound in estimation of the depth of the space; there was a high correlation between ultrasound depth and needle depth (Pearson correlation coefficient r = 0.92, P = 0.00), as shown in [Figure 1]. 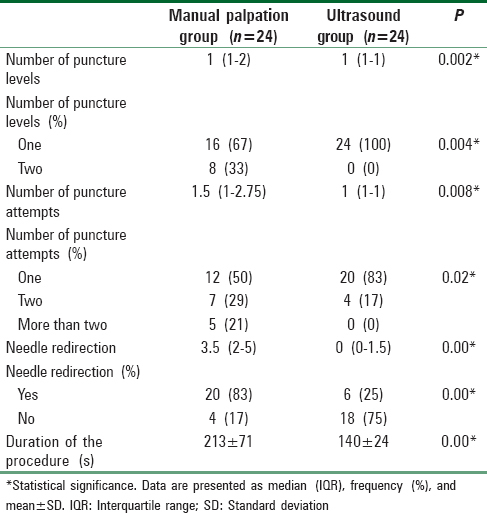 There was no significant difference in the rate of complications (vascular insertion, dural puncture) between the two groups, as shown in [Table 3]. Preinsertion ultrasound examination improved the success rate of thoracic epidural catheter insertion compared to traditional manual palpation technique. This was assessed via two main parameters; the number of attempts (number of puncture levels, number of puncture attempts, and needle redirection attempts); and the time needed to perform the procedure. The use of ultrasound in neuroaxial blocks was reported in many studies, most of them were in line with our results. Previous studies evaluated the use of ultrasound to facilitate lumbar epidural catheter insertion,,,, lumbar puncture,, and caudal epidural injection. Ultrasound guidance for neuraxial blocks was reported in different types of patients (parturients, orthopedic patients, and patients in the emergency room). Ultrasound improved the success rate of spinal anesthesia in patients with difficult landmarks. In a meta-analysis, Shaikh et al. reported that the use of ultrasound in guiding neuraxial blocks reduced the number of failed attempts, as well as the traumatic procedures and needle redirection. Some studies reported no improvement with the use of ultrasound in guiding neuraxial blocks., Most of these studies were conducted on patients with easy landmarks. In an RCT with 128 epidural catheter insertions, Arzola et al. showed no benefit for ultrasound guidance in lumbar epidural catheter insertion in normal labor. Arzola et al. included only patients with easily palpable lumbar spines. Hayes et al. reported no benefit in using ultrasound in the identification of lumbar spaces in children when compared to manual palpation done by the experienced anesthesiologist. Thus, we can conclude that the benefit of ultrasound use in neuraxial blocks is more evident in patients with problematic landmarks. The only study that reported the use of ultrasound in guiding epidural catheter insertion in the thoracic region was a case series done on eleven patients undergoing scoliosis repair surgery, with a successful catheter insertion in eight patients. To the best of our knowledge, this is the first randomized controlled study to compare pre-insertion ultrasound screening to traditional manual palpation in the thoracic region. The improved rate of the first pass with ultrasound guidance would decrease the incidence of hematoma, infection, and postoperative back pain. Moreover; determination of the depth of the epidural space would avoid unintentional dural puncture as well as possible spinal cord injury. Our study had some limitations; we did not report the degree of patient satisfaction with the procedure, we did not include patient subgroups with difficult landmarks. Another limitation is the absence of blindness of the operator. Future studies can overcome this defect by doing the block via two investigators: An assistant who marks the space using either manual palpation or ultrasound, and an operator that inserts the epidural catheter who is blinded to the space detection technique. We found that preinsertion ultrasound imaging was superior to manual palpation technique for thoracic epidural catheter insertion. Ultrasound imaging decreased the number of puncture attempts, the number of puncture levels, the number of needle redirection attempts, and reduced the time to catheter insertion. Grau T, Leipold RW, Conradi R, Martin E. Ultrasound control for presumed difficult epidural puncture. Acta Anaesthesiol Scand 2001;45:766-71. Shaikh F, Brzezinski J, Alexander S, Arzola C, Carvalho JC, Beyene J, et al. Ultrasound imaging for lumbar punctures and epidural catheterisations: Systematic review and meta-analysis. BMJ 2013;346:f1720. Balki M, Lee Y, Halpern S, Carvalho JC. Ultrasound imaging of the lumbar spine in the transverse plane: The correlation between estimated and actual depth to the epidural space in obese parturients. Anesth Analg 2009;108:1876-81. Gnaho A, Nguyen V, Villevielle T, Frota M, Marret E, Gentili ME. Assessing the depth of the subarachnoid space by ultrasound. Rev Bras Anestesiol 2012;62:520-30. Arzola C, Mikhael R, Margarido C, Carvalho JC. Spinal ultrasound versus palpation for epidural catheter insertion in labour: A randomised controlled trial. Eur J Anaesthesiol 2014;31:1-7. Kawaguchi R, Yamauchi M, Sugino S, Yamakage M. Ultrasound-aided ipsilateral-dominant epidural block for total hip arthroplasty: A randomised controlled single-blind study. Eur J Anaesthesiol 2011;28:137-40. Vallejo MC, Phelps AL, Singh S, Orebaugh SL, Sah N. Ultrasound decreases the failed labor epidural rate in resident trainees. Int J Obstet Anesth 2010;19:373-8. Nomura JT, Leech SJ, Shenbagamurthi S, Sierzenski PR, O'Connor RE, Bollinger M, et al. A randomized controlled trial of ultrasound-assisted lumbar puncture. J Ultrasound Med 2007;26:1341-8. Sahin T, Balaban O, Sahin L, Solak M, Toker K. A randomized controlled trial of preinsertion ultrasound guidance for spinal anaesthesia in pregnancy: Outcomes among obese and lean parturients: Ultrasound for spinal anesthesia in pregnancy. J Anesth 2014;28:413-9. Nikooseresht M, Hashemi M, Mohajerani SA, Shahandeh F, Agah M. Ultrasound as a screening tool for performing caudal epidural injections. Iran J Radiol 2014;11:e13262. Chin KJ, Perlas A, Chan V, Brown-Shreves D, Koshkin A, Vaishnav V. Ultrasound imaging facilitates spinal anesthesia in adults with difficult surface anatomic landmarks. Anesthesiology 2011;115:94-101. Hayes J, Borges B, Armstrong D, Srinivasan I. Accuracy of manual palpation vs ultrasound for identifying the L3-L4 intervertebral space level in children. Paediatr Anaesth 2014;24:510-5. McLeod A, Roche A, Fennelly M. Case series: Ultrasonography may assist epidural insertion in scoliosis patients. Can J Anaesth 2005;52:717-20.